A new year is underway, and we're jumping right in with some articles about up-and-coming technologies that may change medical practice. 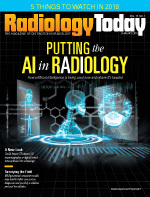 Our cover story features the hottest topic in radiology at the moment: artificial intelligence. It's anyone's guess how AI will ultimately reshape radiology, but Keith Loria talks to some highly respected radiologists to get their takes on where AI is right now and where it's going. Next, Beth W. Orenstein writes about breast CT. While the idea itself isn't necessarily new, technological advances have made it a potentially viable option for breast examinations. It's still in the early stages, but the researchers who were interviewed for the article are excited about their results so far and breast CT's potential to transform diagnostic work-ups and screening of high-risk patients. Another technology with the potential to transform screening is MRI. Kathy Hardy profiles a Worcester Polytechnic Institute researcher who is working on MRI-generated stress maps of the brain that may eventually be used to diagnose sports concussions on the sidelines of sporting events. This topic is especially timely with all of the controversies this year about players reentering NFL games with possible concussions. A fast method for determining whether players—in any sport, at any level—are safe to return to play would be invaluable. Finally, RSNA 2017 was bustling, as usual, and we've highlighted some trends from the show that you may be hearing more about—in some cases a lot more—in the year ahead. Happy New Year, and enjoy the issue.